Hundreds more wells face closure in the next 16 months, while unlined disposal pits remain a problem. 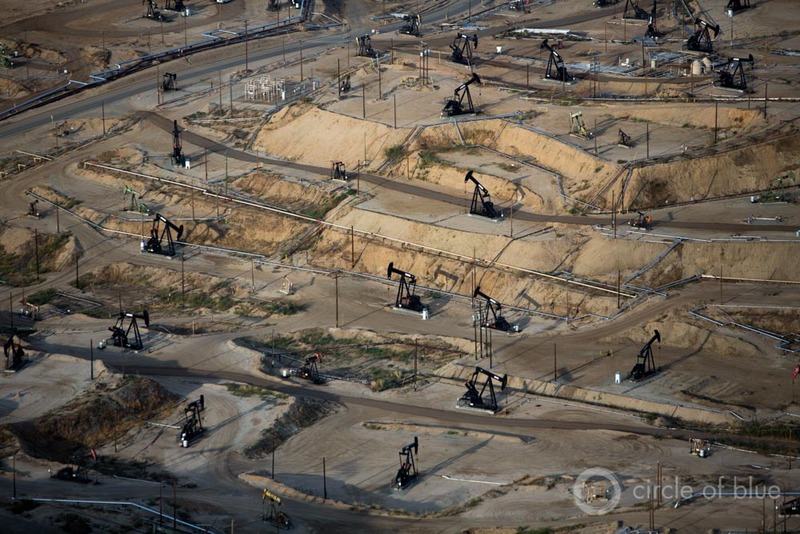 Kern County is the center of California’s oil industry. The state ordered 33 more wastewater injection wells to be closed in order to protect aquifers. Click image to enlarge. A total of 56 injection wells out of 452 targeted for closure have been shut down by the state in the last 12 months following a U.S. Environmental Protection Agency investigation in 2014 that revealed that the California Department of Conservation had been allowing oil companies to inject wastewater into protected aquifers. Operators of dozens of other wells voluntarily halted injection or converted them into an oil-producing well, which is allowed. The closure of the injection wells is the latest chapter in the saga that has developed over California’s oversight of the oil industry’s wastewater. In June, Governor Jerry Brown was sued in federal court by farmers in Kern County, the leading oil producing county. The lawsuit contends that Brown conspired with oil companies in 2011 to remove a regulator who was slow to issue injection well permits. Two days after the lawsuit was filed, one of the officials named in the lawsuit — Mark Nechodom, the director of the Department of Conservation, which oversees oil and gas production — abruptly resigned, citing personal reasons. Also in June, the Legislature rejected two bills that would have added extra layers of scrutiny to the industry’s disposal practices. The injection well closures are a step in the right direction, argue watchdog groups. But the fact that hundreds still have more than a year before they are required to shut down is troubling, they say. In a state mired in drought, every water-consuming practice has come under closer examination. The oil industry is no different. The industry, in fact, is swimming in water — salty water from deep within the Earth, that is. California’s oil fields produce 15 barrels of briny, chemical-laden water for every barrel of oil. Most of that water is reinjected into oil wells to maintain pressure and boost production. But a quarter of the waste is discarded, pushed at high pressure into aquifers that the EPA has deemed sufficiently salty to be used as trash cans. For every barrel of oil pumped in California, roughly 15 barrels of water flow out of the well. Click image to enlarge. But regulators at the Division of Oil, Gas, and Geothermal Resources, a branch of the Department of Conservation, erred. They approved waste injection into aquifers that were supposed to be protected. The deepest concerns surround 178 Category 1 wells. These are wells that injected oil-field waste into aquifers that contain water with less than 3,000 milligrams per liter of total dissolved solids (TDS) and do not have naturally occurring hydrocarbons. These aquifers are too salty to drink from — the federal standard for TDS is 500 milligrams per liter — but pure enough that they could conceivably be used in the future. There is no evidence that an injection well has contaminated water supplies currently used for drinking. Of the 33 wells that were shuttered on October 15, all but two are located in Kern County. Twenty-one of the wells were actively injecting oilfield waste. Oil companies are seeking an exemption from the EPA for 35 of the 178 category 1 wells. Their justification: these wells are injecting waste into aquifers that do in fact contain hydrocarbons. Because they are seeking an exemption, these wells received an extended deadline for closure: February 15, 2017. That is the same date that an additional 297 wells that are illegally injecting into aquifers with a higher TDS concentration — between 3,000 milligrams per liter and 10,000 milligrams per liter — are required to close. “If they want to continue injecting into those wells, they have to bring us information as to why the state should apply for an exemption,” Don Drysdale, Department of Conservation spokesman, told Circle of Blue. Though California manages its Underground Injection Control program, the EPA is in charge of declaring aquifers exempt from the rules. Once a company submits the required information, the Department of Conservation will determine whether it is sufficient to forward to the EPA. Drysdale said the department will consider a number of factors: the presence of hydrocarbons, for example, or indications of arsenic, boron, or other elements more harmful than salt. Eighty-three of the 178 wells are in the middle of a dispute between the EPA, which says the aquifers they are using should be protected, and the state, which claims that the aquifers are salty enough to be used for disposal wells. Unless the EPA grants an exemption, they will be shut down by December 31, 2016. Green groups are pleased that the state is finally taking action, but are disappointed with the timeline. They would also like to see the state take stronger action to address unlined pits, another means of disposing oilfield waste. Unlined pits allow the wastewater to seep into shallow groundwater where it could contaminate domestic wells. There are 619 active pits operating around Kern County and the southern Central Valley, according to the Central Valley Regional Water Quality Control Board. The pit operators must receive permits or be shut down by December 2016. Clean Water Action petitioned the state in August to shut down two oilfield waste facilities in Kern County that the regional board acknowledges have violated their permits and polluted groundwater. Both sites, which include a total of 33 waste pits, are operated by Valley Water. The state must respond to that petition by November 27. The timeline for closing down improperly permitted wells comes from an agreement between the EPA, the Department of Conservation, and the State Water Resources Control Board, Drysdale said. Because there is no evidence of drinking water contamination, injection was allowed to wind down rather than be immediately shuttered.